There are three major factors that influence retirement savings; time frame, market returns, and your savings percentage. By far the most crucial factor is your savings percentage. The rule of thumb thrown around all the time is to save 10% to 15% of your income. This may work if you are starting out saving as a teenager and have a time frame of 4 decades, but otherwise increasing your savings rate is the most important thing you can do. I hear all the time that saving more money is impossible. I don’t buy it. It all boils down to your priorities. “Show me a man’s budget and I will tell you his priorities.” Fast food, alcohol, trucks, cigarettes, Mcmansions, private school, and a myriad of other OPTIONAL items clog our budgets. There is of course the income side of the equation as well. I know FAR too many people who complain about not being able to get ahead while working an “obamacare” part time job of 30 hours per week, or even a “full time” job of 40 hours per week. We all get 168 hours per week and how you choose to spend your TIME BUDGET is just as important as how you spend your income. Work an extra 10 hours and you increase your income by 25%. Work 60 hours per week and you just increased your income by 50%. Nothing magical, just math. You can also learn skills and earn certificates and degrees and sell your time for a larger amount of money than what you currently do. ALL of these aspects combined can and will free up money in your budget to increase your savings rate. The most interesting thing to me about savings rates is that each incremental change in savings rate results in a massive change in time to financial freedom. 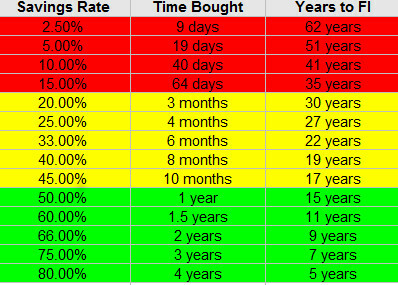 Excluding market returns, a 10% savings rate buys you about 5 weeks of time, a 25% savings rate buys you 3 months of time, a 50% savings rate buys you 1 year of time, and a 66% savings rate buys you 2 years of time! It takes a 33% savings rate to buy 6 months of time, but you only have to save another 17% to hit a 50% savings rate and buy the 2nd 6 months of time. Saving only 10% more buys another 6 months. This is the magic of an increased savings rate. Since you are living off of less you are getting double the value for every percent you switch from spending to saving. Once you hit a 50% savings rate you are saving 1 years worth of expenses for every year you work; even without great market returns, you can achieve financial independence relatively quickly. Looks like a pretty cool place to be! Notice how the time bought for savings rates of under 20% are measured in days, between 20% and 45% are measured in months and savings rates of 50% plus are measured in years? Mathematically these are major thresholds to shoot for. The higher your savings rate is the less dependent you become on market returns as well. If you get to a 66% savings rate, even if you just put the money in a bank account, after working 20 years you will have 40 years of expenses in the bank with 0% investment returns! With this chart you can see how quickly increasing your savings rate changes your world. Going from 10% to 25% is huge, but going from 25% to 50% is of much greater value. Once you hit 50% going to 66% changes the math dramatically. My long term goal is to strive for a 66% savings rate. To show what this would look like for the median household, I made another chart showing how much money we are talking about for a median household earning $50,000 per year. *A 7% annualized rate of return was used to determine years to FI, as well as a nest egg of 25X annual spending, accounting for a 4% yearly withdrawal. Obviously it is much easier for someone earning $100,000 a year to save in excess of 50% of their income, but it is not IMPOSSIBLE for someone earning $50K to do so. Believe it or not there are many people in this world who live off of under $25,000 per year. In order to increase your savings rate, expenses and income must both be on the table and you must strive to increase the delta as much as possible. As an example, we will take a household earning $50,000 a year and work towards a high savings rate. 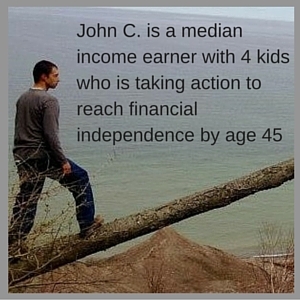 John is married, has 2 kids, and a median household income of 50,000 per year. John works 40 hours per week and earns $40,000 per year, while his wife works around 10 hours per week and earns $10,000 per year. He already follows this $50,000 a year budget and has a savings rate of 29%. What can John do to go from a pretty good savings rate of 29% to over 60%? Step 1: Earn more: If John works an extra 13 hours per week on average at $15 per hour, this works out to $10,140. If John’s wife works an extra 13 hours per week on average at $15 per hour we add another $10,140. Working TOGETHER they increase household income from $50,000 per year to $70,280. Okay these step one changes brought us from making $50K and saving $14,400 to making $70,280 and saving $34,680, just shy of a 50% savings rate. John is now averaging 53 hours per week while his wife is averaging 23 hours per week. I asked my boss to have a conversation with me about my performance. I discussed my accomplishments and how I view my performance, and asked for feedback. I then asked what, if anything I could do to become more valuable to the company. Twice the employer offered me a raise right then. Once I needed to state my rate of pay and tell my boss my target is $5 above that, he then offered me a $3/hr increase. It helped that I knew what the company paid others in similar positions as well. When I talk to an employer about a raise I approach it as a mutually beneficial meeting. Far too many people ask for a raise when they are angry, or flat out state they will quit if they don’t get one, that behavior paints you into a corner. Using the figures mentioned above, and only counting base income, before working extra hours or a side job, John would increase his earnings from $40,000 per year to $46,000 per year. Throwing that $6,000 into savings now brings total income to $76,280 and savings to $40,680, a 53% savings rate. The book Getting To Yes: Negotiating Agreement Without Giving In has helped me substantially with negotiating. 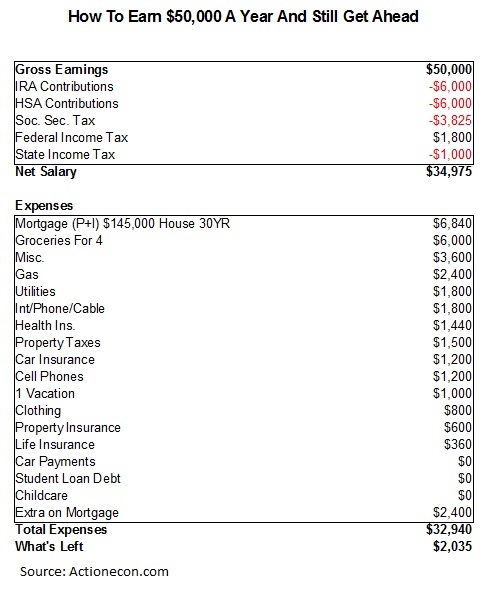 Step 3: Reduce expenses: In this example John is spending around $36,000 per year. We want to challenge John to reduce his expenses by 20%, do you think you could reduce your expenses by 20%? Plenty of people live off of far less than $30,000 per year. If John can reduce his expenses to $30,000 this would put him at $46,280 in savings, a savings rate of 60%. To do this we will concentrate on the 3 largest expenses in the budget, housing, groceries, and misc. Housing: Housing is necessary, however the sum total we spend on it is clearly not. In the above example John is living in a $145,000 home. In his area you can buy a decent home for half of that price. If John sells the house and buys one costing half as much, he could cut his house payment in half. In all reality it would actually go down by more than half because he would roll the 20% equity from his down payment into the new house, which would be 40% of the total price of the new house, but just to make the math easier we will go with cutting the cost in half from $6,840 per year to $3,420 per year. This move will also cut property taxes in half from $1,500 per year to $750 per year. This is a total savings of around $4,000, cutting total spending down to $32,000. Selling the family home is not an appealing option to many people, however if the true priority is a high savings rate and early financial independence, it is a sacrifice worth making. Groceries: John and his wife used to competitively grocery shop at three different locations; Meijer, Save-a-lot, and Aldi’s. All are located with a couple blocks of each other and have different items on sale each week. Over the years they elected to shop only at Meijer to save some hassle. If they were to start competitively grocery shopping again, they could reduce their grocery bill from $500 per month to $400 per month. $25 per week doesn’t like much, but it adds up to $1,200 over the course of the year. This brings total spending down to $30,800. Okay, so obviously I’m using my situation as an example here. Mrs C. and I successfully increased our income from around $50,000 in 2013 to around $73,000 in 2015, and 2016 is on track to be even better. We have implemented several cost cutting reductions, however our home is a bigger priority than hitting financial independence 2 -3 years earlier, and that is OKAY. It doesn’t matter what your priorities are, so long as you are aware of what they are. For 2016 I am shooting for a 50% savings rate, perhaps 2017 and beyond will bring us to a 66% rate. At a minimum we should hit a 66% rate once the house is paid off, which shouldn’t be too terribly long from now. On another note, I didn’t include taxes in this example because everyone’s tax situation is different and I felt it would muddy the waters of the main point (which is the drastic difference it makes to save more money). I also want to note that the F/I numbers are for years after you have built a strong financial base. The savings you have for the first several years as an adult typically go towards getting established, buying a first home, buying a decent vehicle, paying for a kid or two, etc. Even with being very financially disciplined, Mrs. C. and I didn’t start throwing any substantial amounts of money toward Financial Independence until 2013 when I was 27. What steps are you taking to increase your savings rate? Do you agree that the conventional wisdom of saving 10% – 15% of your pay is too little? 4 Responses to "How To Increase Your Savings Rate, and Why"
Very cool! There is no ceiling to how much income we can make, but there is a floor to how cheaply you can live with a reasonable standard of living. Once I get to 66% I’ll be happy. Being able to save 2 years of living expenses for every year I work is a great place to be, I know I’ll be there once the house is paid off, but with income increase I might be able to push it to 75%. Our approach is to keep our level of life style constant. Each income increase or spending cut goes to extra saving. That sounds like a good plan. The super easy way to do this for anyone starting out is to stop inflating your lifestyle! Start saving all bonuses, raises, side incomes, and it will quickly grow your savings rate.